The welcome sign to my area of town near Din Daeng intersection, with charred buildings in the background. Like the flick of a switch, Bangkok has returned to normal. On the surface, things are running smoothly once again, and there is a wary calm throughout the city. The BTS SkyTrain has resumed service, shockingly in all stations save for one. The MRT is running and the huge malls will reopen around Ratchaprasong on Tuesday, with only the gaping hole where CentralWorld was to remind us of last week’s crackdown and the arson that followed. It is surreal, and to my Western mind it is unsettling. Yesterday, I took part in a city-wide effort to clean up the Rachaprasong and Chidlom areas, joining thousands of mostly Thai people in scrubbing down the BTS poles, sweeping the streets and cleaning up debris from the former rally site. 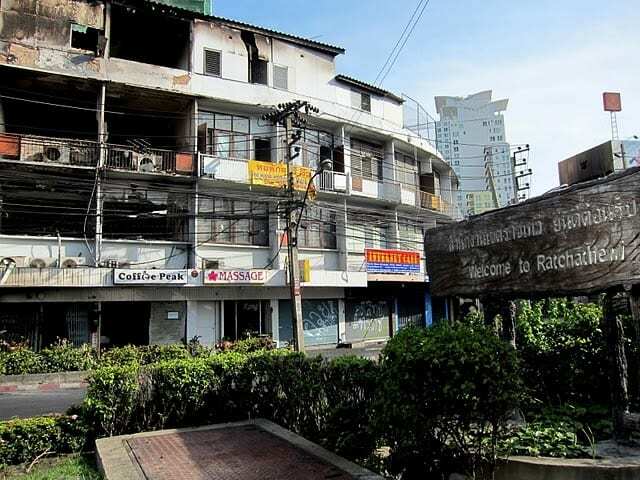 Over the last few months, I’ve been in the Chidlom/Silom areas to take pictures, to interview the red leaders, to photograph the devastation following the grenade attacks on the 19th of April and now to clean up after the army moved in and took back the area. It’s strange to think of how swiftly the clashes progressed, from raucous joy, to anger, to devastation.